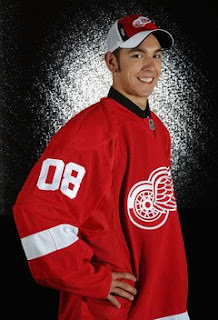 With the aplomb of a seasoned politician, 2009 recruit Max Nicastro "clarified his position" on being drafted by the Red Wings during Monday's session at Detroit development camp. Nicastro added that the non-hockey person he'd like to take to dinner is Barack Obama. The article on the Red Wings site includes a video link to a so-so interview with Nicastro after yesterday's session.